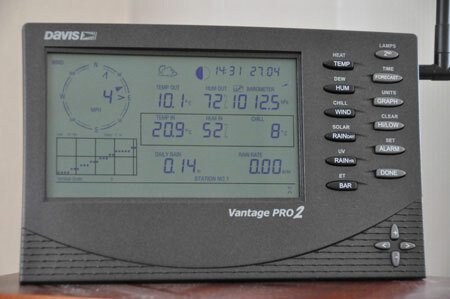 I use the wireless Davis Vantage Pro2. It became operational on 30 April 2009 and I started using Cumulus on 10 May 2009. In May 2011, a daytime Fan Aspirated Radiation Shield (FARS) was added to further improve temperature accuracy. The station is located in my rear garden well away from sources of heat at a height of 5.5 feet. This is slightly higher than the Met Office recommended height of 4 feet but this ensures a better movement of air around the station. 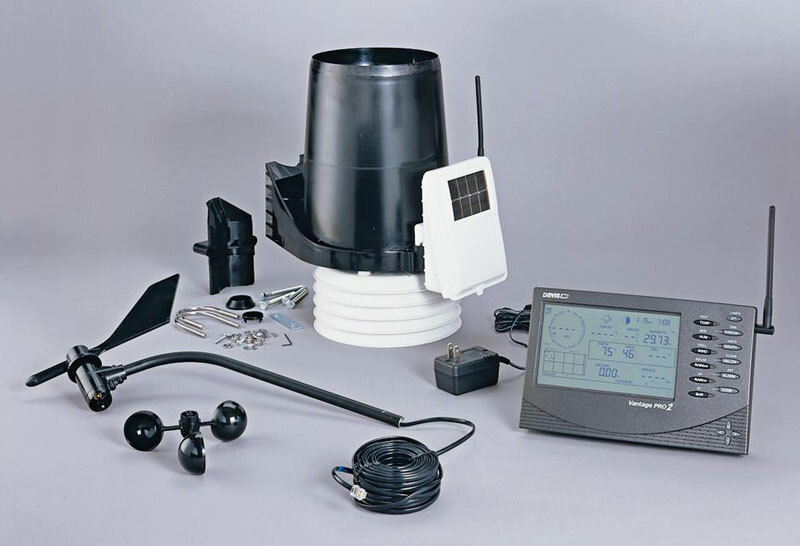 The rain gauge measures rainfall via a tipping bucket mechanism. Rain falls through a small hole in the collector onto one of the buckets. When it's full the water tips out and 0.01" of rain is added to the rain total. The other bucket then captures the rain and the process repeats itself. The daily rain total is reset to zero at midnight. 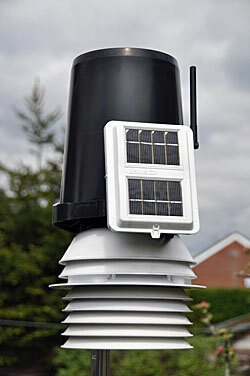 The white radiation shields surround the temperature sensor and prevent direct sunlight falling on it. Air flows between the shields and on calm sunny days a solar-powered fan keeps the air circulating preventing a build-up of heat. The data is transmitted wirelessly back to the console several times per minute. 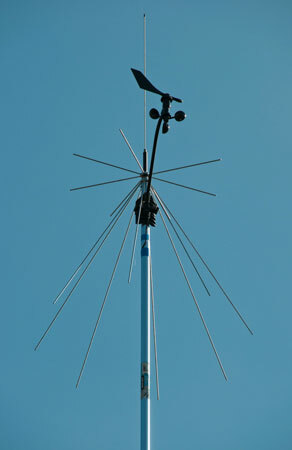 The anemometer is located 30 feet (9.2 meters) up attached to an aluminium pole lashed to the chimney stack. It's wired to another solar-powered transmitter which sends wind data back to the console every 2.5 seconds. It's been totally reliable over the last 10 years and is testament to the quality of Davis products. Pigeons do occasionally perch on it but don't stay long! Data from the two transmitters - one in the rear garden and one attached to the anemometer - is sent wirelessly to the console in my lounge. It is connected to a Samsung NC10 netbook which uploads data to this site and also to WUnderground and the UK's Met Office WOW Project. This WUnderground map shows other weather stations in my area.